A year or so ago Ted Bower crossed my mind. I did a cursory search and found somewhere that he had died. Having other things on my mind at the time, I didn’t follow up on the information. Then the other day I read an article in The Pacific Sun, a Marin County (California) weekly newspaper, on Daniel Liebermann, an architect who worked on Frank Lloyd Wright’s last, posthumous project, the Marin Civic Center, after Wright’s death. (Article url http://www.pacificsun.com/story.php?story_id=5377 ). This led to another search for Ted Bower and better results – which I will share below. I didn’t know Ted all that well, spending time with him on four or five occasions in Molly’s apartments in New York, but we seemed to hit it off and respect and liking seemed to be mutual. The last time I saw Ted was just about forty years ago when he and his wife, Diana, visited their son who was living in an ashram in Oakland, and came to spend an afternoon with Barbara and me at our Larch Road house in Bolinas. To recapitulate the Bower family context, as spelled out in the Satish Gujral post: the father was a surgeon, professor of surgery at the University of Pennsylvania and Chief of Surgery at Philadelphia General Hospital; the mother was very religious, becoming more so as she aged. They had six children, three boy-girl pairs named, in birth order, Jack and Jill (really), Theodore (Ted) and Joan (pronounced Jo-ann) and Robert (Bobby) and Mary Margaret (Molly). Jack became a dentist, moved to Iowa, probably his wife’s home and a Baptist bible-thumper (wife again?). Jill was mentally impaired from birth and was the origin of much misery in the family, including the mother’s religiosity. The much more sensible siblings eventually convinced the parents to allow Jill to live in a house of her peers where she had companionship, suitable work to do and was very happy. Bobby followed in his father’s footsteps and became a surgeon. I know nothing more about him other than he is retired. Molly was a year ahead of me at the University of Chicago, a roommate of my first wife, Terry Flambert, in Kelly Hall and my lifelong friend until her death from cigarettes in 1997. I believe that Joan, now in her late eighties, and Bobby, now in his mid-eighties, are still living. Leslie, one of Molly’s daughters, told me that at some time in the last decade or so, Satish came to Washington, DC and hosted a dinner with Ted and her self present. She made special note of how gracious a host Satish was. Contentment comes with a long life well lived. My search this time was much more productive both for biographical facts and pictures. 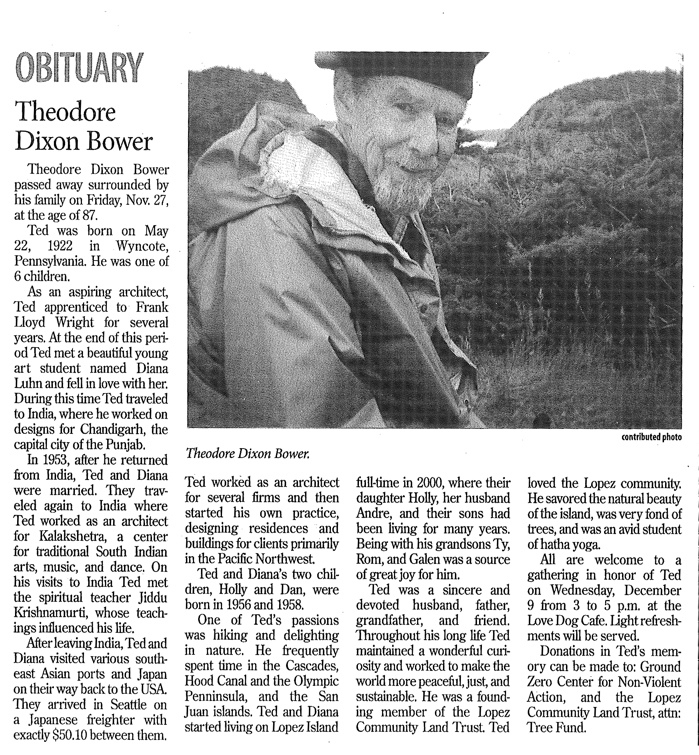 First, I found an obituary for Ted in the local, Lopez Island, Washington, newspaper. Next, I found this article in Docomomo-wewa, the website for the western Washington state branch of Docomomo-us, an organization dedicated to appreciation and awareness of modern movement architecture and design. graduates who practiced in Washington State during the 1950s and 1960s. apprenticed at Taliesin until 1948.
leaving Taliesin, Bower traveled in Europe and then took a job as a “Jr. Besant Centenary Trust working on designs for schools throughout India. Lovett, the pedestrian walkway shelters for the Century 21 Exposition. became heavily involved in the Center of Nonviolent Action near Poulsbo. Bower passed away on Lopez Island on November 27, 2009. Docomomo WEWA is seeking additional information about the life and work of Ted Bower. Note the mention of Chandigarh. Satish has a much more elaborate notion of Ted’s career in India. I met Ted for the first time when he was working for Wright on the Mount Pleasant project. He told me at that time that he left Taliesin West the way everyone did – after a big and bitter fight with Wright. Mrs. Wright also figured prominently in these unpleasant exits. A chat room discussion after Ted’s death was filled with insights, large and small. Much of Ted Bowers time at Taliesin was during WWII. Those were frustrating years when the life of art and community at Taliesin was constrained within a war economy. Rather than active work in the drafting room, the common bond was the understanding that “war was the real enemy” (Randolph Bourne’s words). Howe and Davidson had been stolen away to sit in prison, unable to mentor and buffer other apprentices in the wake of Wright’s genius and the fury of Mrs. Wright’s insecurities. Ted Bower’s spirit survived the experience. 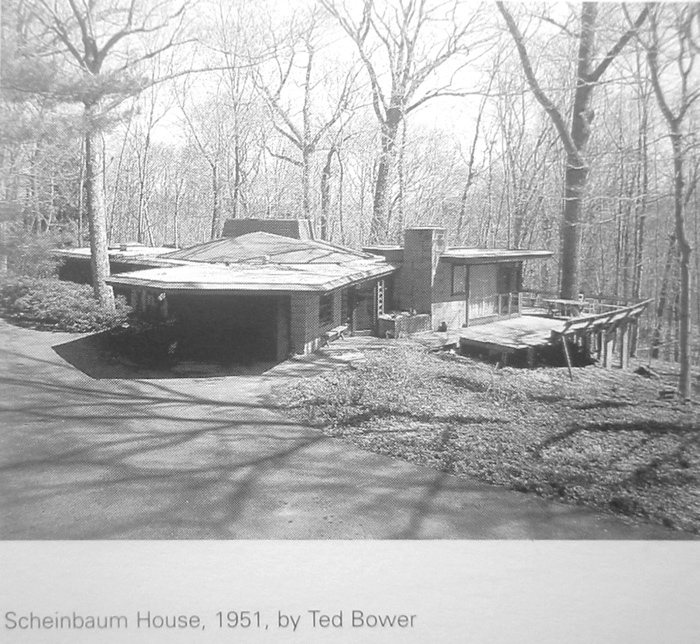 Finally, in 1948, Ted Bower took the opportunity to leave Taliesin without leaving the work of Taliesin- supervising the Weltzheimer House. I can imagine the unleashed zeal he brought to Oberlin as he managed the clients and the construction- all the while learning with his hands, resolving one problem after another. The Weltzheimer perforated board design is wholly Ted Bower’s design and it adds distinction to the staid L-plan Usonian that stands as a final work of the board and batten period. 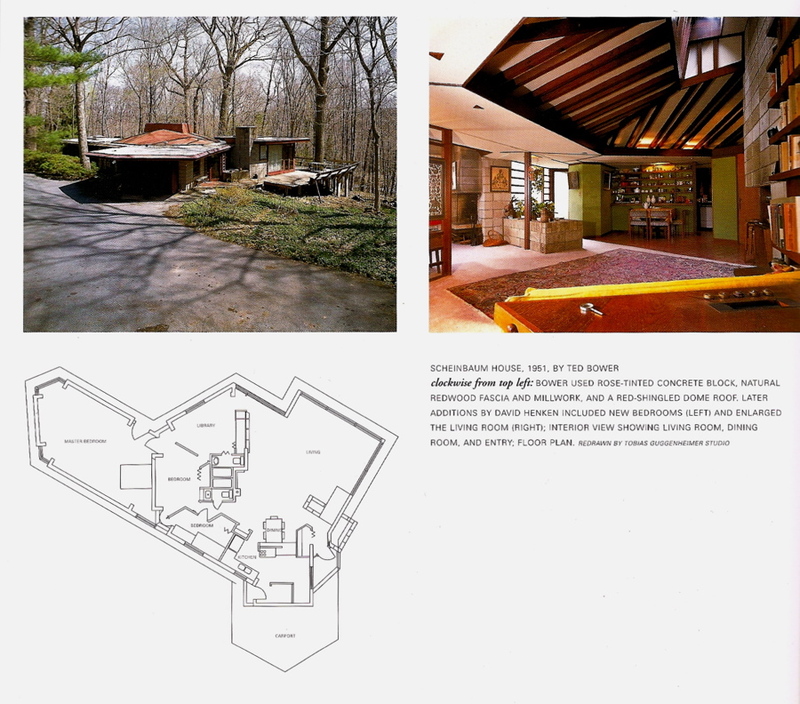 It was Bower’s hard work (and hard-won luck) that from the Weltzheimer House he moved on to Usonia to realize the idiosyncratic Toy House, the quiet grace of Serlin and his own designs of the Glass House and the challenging Scheinbaum House. He crammed important houses into his last Taliesin years before launching his own practice and living his own considered life in art. 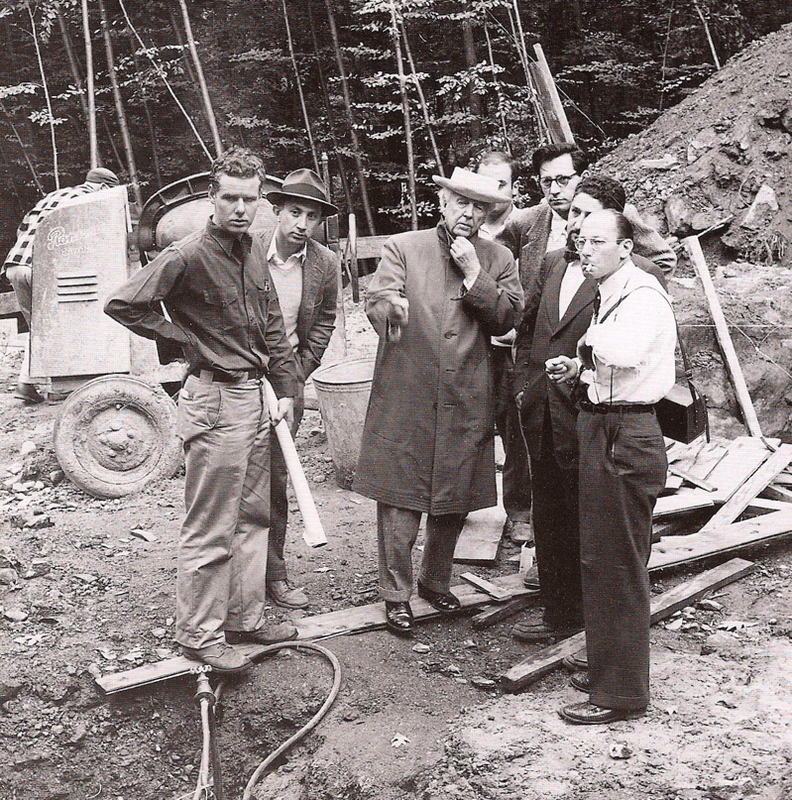 Photo taken at the Friedman house site, in Reisley’s book. Taliesin. Try to do something free from such affectation. There was an interesting article in The New York Times on Reisley and the house Wright built for him. 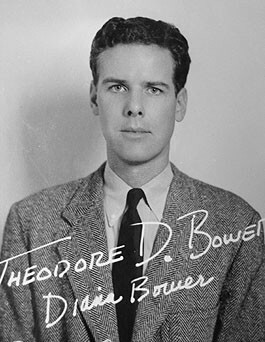 My father, Robert Dawson/industrial designer, was a friend of Ted Bower’s in the 40s and met Wright through him — later collaborating with Wright on Beth Sholom — maybe some other projects. There was a story about Ted and Wright, that he was engaged to Wright’s daughter and broke off the engagement — after which Wright asked him to leave Taliesin. I am somewhat skeptical of the engagement story because of comments both Ted and Molly made regarding his departure from Taliesin West. He said he left as everyone did – after a big blowup with Wright. Mrs. Wright figured prominently in all of the exits. She was usually portrayed as something of a Lucrezia Borgia, carefully watching everyone for signs of diminishing devotion to Wright and “killing” those found guilty. 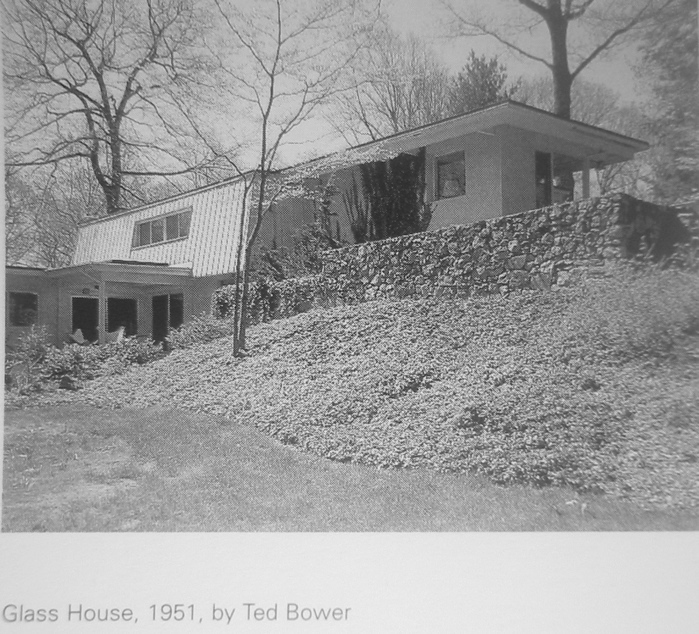 Wright gave Ted the supervision of construction of one of his Hudson Valley houses to mend their relationship.